1964 | The Fantastic Flame On! 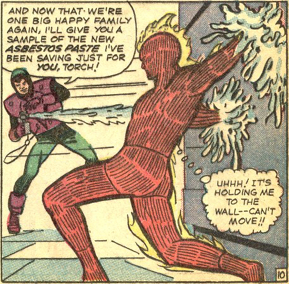 As we make our way through the final 10-or-so issues of Johnny Storm’s solo adventures in Strange Tales, we’re going to see logic (not a quality seen in abundance, admittedly) become scarcer and scarcer. 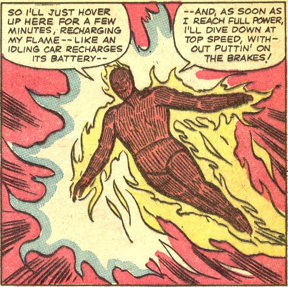 Here’s a good example of a panel which should never have been drawn, and which should have been picked up by anyone involved in the creative process from the penciling onwards. 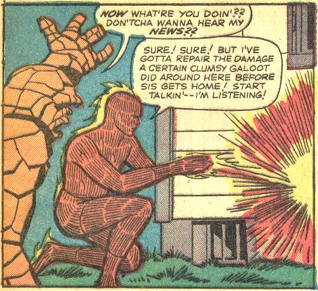 Having had half of his house destroyed by The Thing’s refusal to use the front door, Johnny then decides to some on-the-spot spot-welding to repair the damage. 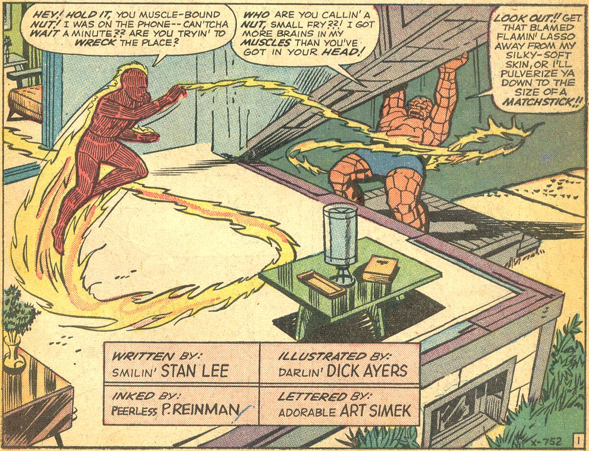 So, he uses his intense heat and flame to repair his very obviously wooden house. 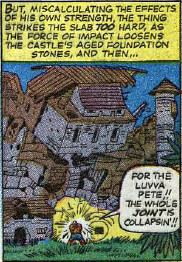 This is why I should read ahead… It turns out that a suit of armour is a fairly minor piece of property damage when compared to the completely accidental loss of an entire artefact-filled castle. I really wish I had the ability to put a conjectural price on the loss of the castle, much as people have done with the destruction to Metropolis and New York in Man of Steel and Avengers. So many one-of-a-kind antiques lost forever, as well as the unique alchemical knowledge of Diablo. Talking of Diablo, he really is one of the lesser Lee/Kirby villains to have gone on and feature within the Marvel universe. He’s one of my least-favourite, even though his origin story far outweighed my expectations. 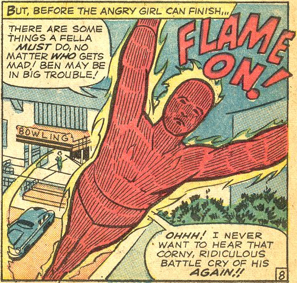 It’s not that the gimmick of the villain doesn’t work for, it’s that it’s so horribly mis-applied. Instead of being a genuine, rare mystical villain for the team, he often gets reduced to an unlikely potion master, with coloured liquids causing all sorts of strange things to happen. He’s not a villain I look forward to returning. Steady on, Ben. You may be angry with Diablo for partially restoring your humanity, deceiving the world, enslaving his neighbours, and all sorts of dodgy stuff that would make the CIA look on with envious eyes, but that’s an antique suit of armour you’re crushing up like aluminium foil. 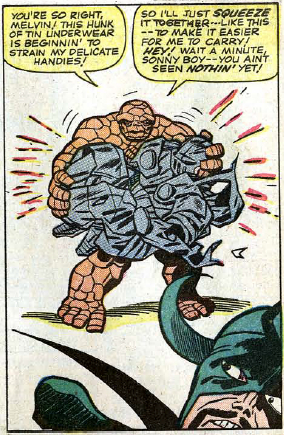 Those things are worth a decent penny, and as we know, the Fantastic Four have their fair share of cash flow issues. You’re literally crushing financial security in your giant, rocky fists. This is the road that leads to having to deal with Collins on a monthly basis!